House of Fraser transform web chat into a key pillar of their real-time customer engagement strategy. 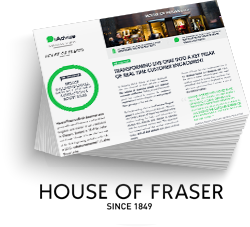 House of Fraser have met customer care and sales objectives. House of Fraser is a British department store group with over 60 stores across the United Kingdom and Ireland. It has one of the fastest growing websites in the UK; at the start of 2016, websales represented 20% of the Group’s sales. "Having worked with iAdvize since 2013, we recognise the importance of having a clear, defined and structured targeting strategy to help drive the right sort of contacts - maximising the customer experience and adding value through web chat interactions! " © Copyright 2016 iadvize.com, all rights reserved. All brands mentioned belong to their respective owners.